Sounds daft, but take a look at the insole of most cycling shoes. Notice anything…? They’re nothing like the same shape as your feet. For optimum efficiency, comfort and performance, cycling shoes need to be as close as possible to the shape of the foot with the ball of the foot positioned correctly over the pedal spindle. That’s where Bont shoes come into their own. Not only are they heat mouldable, the last is designed specifically to mimic the shape of the foot. The most comfortable, efficient cycling shoes you’ll ever wear. NEW :: Wide Fit Bont A3 Road Shoes now in stock in our most popular sizes. 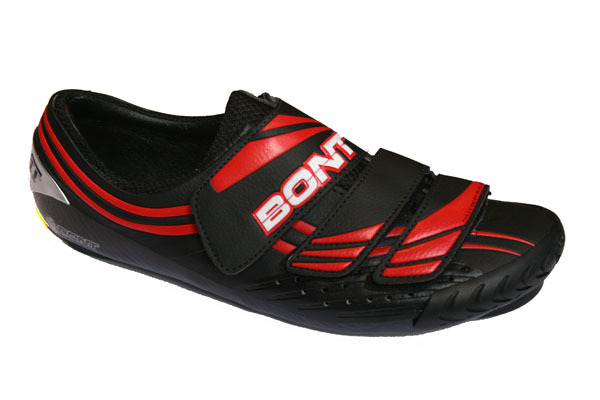 SEE OUR RANGE OF BONT SHOES ONLINE HERE. This entry was posted on Saturday, July 23rd, 2011 at 11:24 am	and is filed under All Posts, Bike Fitting, Products. You can follow any responses to this entry through the RSS 2.0 feed. Both comments and pings are currently closed.